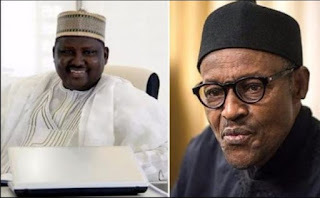 The man in the eye of the storm, Abdulrasheed Maina, has explained that he went into hiding to save his life from “powerful thieves” in the corridors of power who vowed to silence him. He said their anger is that he has the effrontery to ask former Minister of Finance and Coordinating Minister for the Economy, Dr. Ngozi Okonjo-Iweala, to stop multi-billion naira monthly allocations being shared by the thieves under the guise of paying pensioners. Maina, who spoke to Berekete Family, an Abuja-based Radio Show anchored by Ahmed Isa, said he was ready to come out from hiding to spill the beans with relevant documents if President Buhari would provide him adequate security. Maina denied stealing pension money, saying his task force did not operate accounts and challenged anyone with proof that he was given any government money to present the proof to Nigerians. As reported by ThisDay, Maina also stated that his team carried out biometric exercise, stressing that the exercise was approved by the Head of Service and not him. Asked if he would come out of hiding and spill the beans if President Buhari gives him the necessary security, Maina said: “I am ready and half of those people will run away and leave Nigeria.